Coming up for all the major states of Australia, will be the Winter break (often two or three weeks of school holidays). Often, it’s a good time to plan a road trip to escape to the warmer weather. In this blog post, I will be reviewing several ‘tech’ products that are a must have when planning that long journey. If you are anything like our household, we have a combination of Samsung Phones (which of course require a different adaptor, iPads, iPod Touch (30 pin Adaptor), GPS and charging our normal camera. Our current car sound system only likes the 30 pin USB adaptor (hence we can only use the iPod touch connected to the sound system and not the iPad). 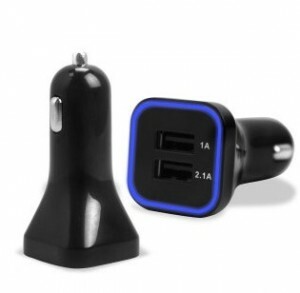 Buy a double USB to Cigarette Lighter adaptor. This can be used to power several devices. Make SURE they are a similiar voltage, otherwise your car’s electrical system might decide to collapse! 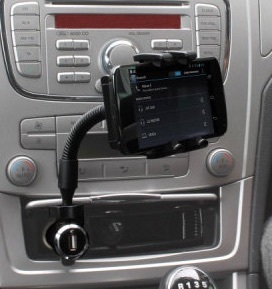 Some come with a car kit, where your smartphone can be mounted. It is then great to download maps such as TomTom Maps for Australia for your trip. Sometimes you will need a battery for the mobile devices (if you are not driving around all the time). Always carry SPARE cables. Much easier than trying to find a shop when you are on the road. 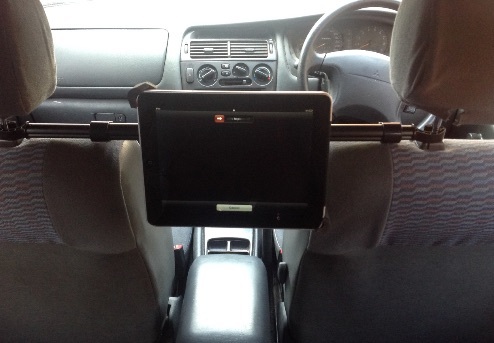 Recently we have had the chance to test drive this Olixar Universal Tablet Car Headrest Mount Pro from Mobile Zap. Pro’s: We only need one iPad in the backseat (and no it’s not going to be on all the time). Con’s: Our girls expect that the iPad should be in there all the time if they are sitting in the back of the car! This particular product requires that the seats both be at the same distance (harder when one of the passenger/drivers has longer legs. 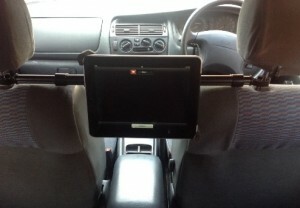 It easily mounts around the headrest (as seen in the images below). I would recommend buying one of these Belkin Rockstars (either from eBay or online). They are amazing headphone splitters ( great for having three kids in the car) as you can plug in three separate headphones. If you happen to have Bluetooth headphones for the kids, connect the headphones via Bluetooth instead to the tablet/iPad. Tip: You are going to need to be able to charge the iPad/Tablet during the journey. Make sure the cable is long enough to reach the USB to Cigarette lighter. So, let us know how you cope with a roadtrip…and have lots of fun! P.s My husband and I often listen to podcasts for a roadtrip, usually 20 mins long each time and then discuss in between. This is primarily as we have discovered we have VERY different tastes in music. Share how you cope on long road trips..